7 UP FOR BALDOCK TOWN! 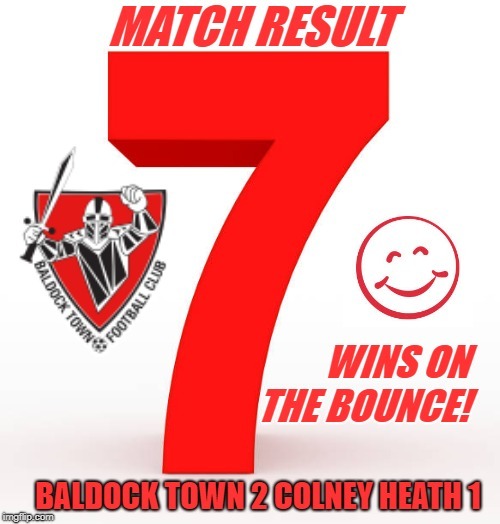 In front of a healthy attendance of 121, Baldock Town increased their winning run to 7 matches with victory against the Magpies of Colney Heath in this Spartan South Midlands League Premier Division encounter. Manager Luke Gregson made 2 changes to the side that won last week at London Tigers with Charlie Hayford returning to midfield instead of Sam James and Alfie Barker starting up front, replacing the departed Russell Bull who joined Godmanchester Rovers in midweek. The first half was soon to become the Lewis Barker show as the stand-in Captain Marvel was to find the net twice in nine minutes. In the 34th minute he got on the end of a Kim Forsythe flick to give the Reds the lead and two minutes before the break he thundered home a header to double the home advantage. The only scoring action in the 2nd half came in the 67th minute when a Colney Heath free-kick went through the Baldock wall and wasn’t held on to by Adam Harpur, resulting in Jack Woods tucking away the rebound. Baldock’s 7th win in a row puts them up to 11th in the League table. Their next match is this coming Wednesday evening when Harpenden Town will be the visitors to the New Lamb Meadow. Baldock Town: Harpur; Brooks; Furness; Hayford; Gilbert; Barnes (Denniss); Joy; L Barker ©; A Barker (Coppin); Forsythe; Buchanan. Unused subs: Ngwala; Payne; Farmer (GK).